The “Fiske Guide to Colleges,” a leading college guidebook, has selected the University of Richmond, which it describes as a “forward-looking campus,” for its 2019 edition of “best and most interesting schools” in the United States, Canada and Great Britain. 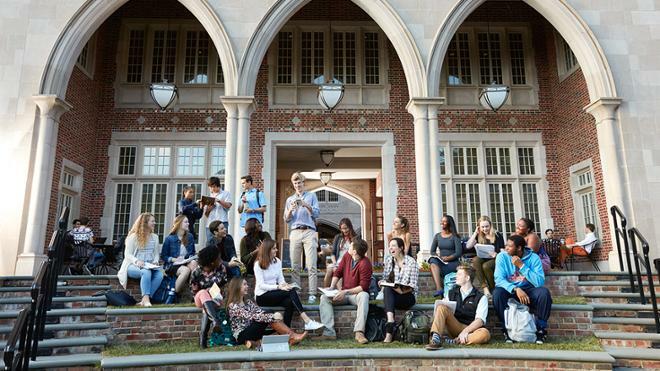 “Students at the University of Richmond enjoy a healthy mix of Southern ambiance and intellectual rigor that includes small classes, close friendships, and lots of teamwork,” the guide notes. The school’s First-Year Seminar with faculty drawn from across the university on topics ranging from bioethics to art history is highlighted in the guide. Enrollment in the program is capped at 16 students to ensure that faculty members can focus on their students’ writing. Also noted is the “especially sought-after” Sophomore Scholars in Residence program, a living-learning program that combines a yearlong interdisciplinary course, a group capstone in the spring, and various opportunities for community-based activities and domestic or international travel. The guide also tout’s UR’s commitment to “globe-trotting” with sixty-three percent of undergrads studying abroad with university support. UR partners with 75 institutions in more than 30 countries. Compiled by former The New York Times education editor Edward B. Fiske, the guidebook selects colleges based primarily on academic quality. It selects about 300 schools and includes information about each college’s academics, social life, student body, financial aid, campus setting, housing, food, and extracurricular activities. Preprofessional education shaped by commitments to the liberal arts, leadership, and community involvement.